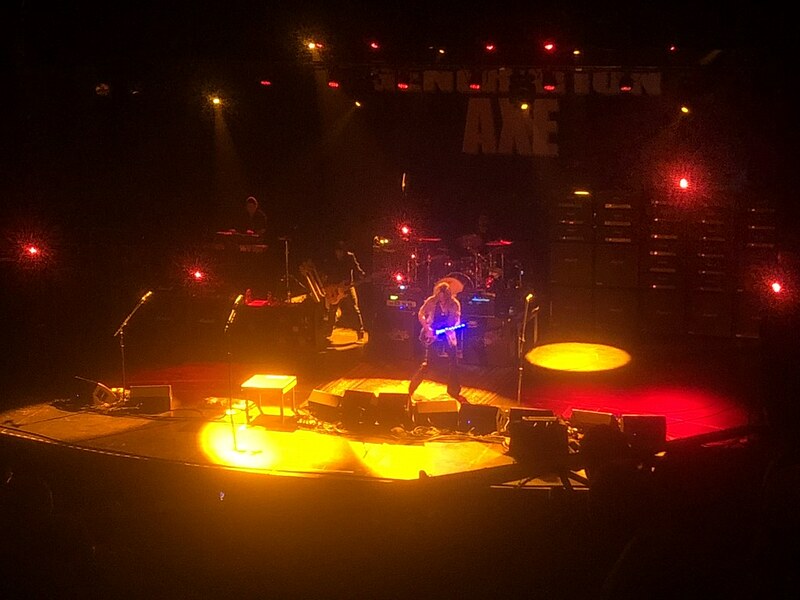 This is a post of tidbits and anecdotes about my relationship to the guitar players of this tour disguised as a review of the concert in general. As always, all photos displayed directly on this site are my own. Because I was on the balcony with an iPhone, and concentrating on rockin’, the photos are not very good. The guy in the cover photo is from a completely unrelated event and just happens to sort of look like Joe Satriani, who was not actually part of Generation Axe. I got my first electric guitar in 1992, which opened my then 12-year-old eyes to music that my parents didn’t know about. The Beatles and The Beach Boys were replaced with Guns ‘N’ Roses and Metallica. The Internet wasn’t something I could even conceive of so my main source of music news was Circus Magazine and Hit Parader. A few years later and heavy metal music was being crushed by grunge, but I didn’t care to learn Nirvana or Pearl Jam riffs. I checked the grocery store aisles weekly for the latest edition of Guitar World to find the secret tabs behind songs from Extreme, Ozzy, and Steve Vai. 25 years later and a set of my guitar heroes announced a concert in my town, a short 15 minute walk from my house. “Generation Axe” featured Nuno Bettencourt (Extreme), Zakk Wylde (Ozzy, etc), Steve Vai, Yngwie Malmsteen, and Tosin Abasi (Animals as Leaders). I knew finding a companion to this event would be a challenge, and I didn’t want to drag someone along out of pity that didn’t share the same passion and history of 1994 guitar slinging, and forgiveness of hair-style and dress. I made some small attempts, but ultimately didn’t want someone who didn’t share the same joy of competitive virtuoso metal gods. I took myself, with the memories of my 14-year-old self as my only companion. 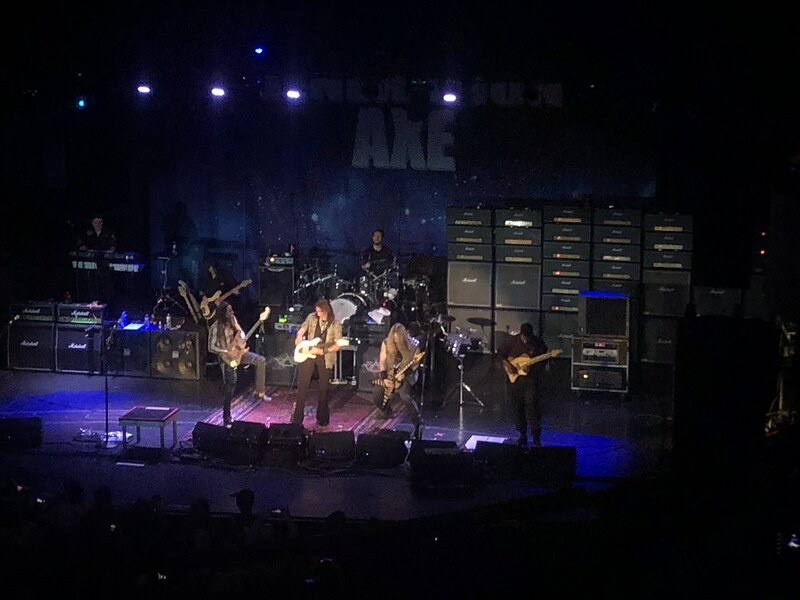 The Generation Axe tour reached Medford Massachusetts on November 23, 2018. The Chevelier Theatre proudly housed my daughter’s dance recitals in the past, but for this night the stage freight of 300 3-9 year olds was replaced with the smell of beer, showmanship, and confidence. Some may say arrogance was on display, but those people likely were the people that declined an invitation from the 1,700 of people in attendance otherwise having a good time that night. All 5 guitarists came onto the stage for a quick opening number and displayed their unique physical (and sometimes cartoonish) styles. Their musical styles wouldn’t be defined until their individual sets. Nuno Bettencourt looked suave and dreamy as his long latin locks obscured his fast fretwork. Zakk Wylde’s hypnotic guitar dragged along the floor whenever he was not standing on a table. Steve Vai just looked professional and dazzling as always. Yngwie Malmsteen was flamboyant and ageless, and looked just like I remember from the Hit Parader fold-out posters on my wall in 1994. Tosin Abasi drew a dorky smile with his guitar hiked up to his upper chest. They opened with Hocus Pocus by Focus, but of course, in the style of local guitar slinger Gary Hoey. It was a perfect opener for my imaginary guest. I don’t play guitar much today, but if I was handed a guitar and given an hour to play, I’d most likely play a bit of Hocus Pocus. Tosin Abasi was the opening act, and the youngest outlier among the other 4 elder axemen. But even if he was 20 years deep into his career I don’t think I’d have the same fondness for his catalog as it’s so technically outside the wheelhouse of an average 14 year old. Plus, the requirement of a 8-string guitar puts it beyond of the price range for most middle class birthday gifts at around $4000. If we lived in the same town we may have bumped into each other at the local supermarket looking for the latest issue of Guitar World. Nuno made all the dad jokes for the evening. Someone had to suggest that the performers were being paid by the note. Someone had to make reference to National Geographic magazine being a hidden gem to adolescents in the pre-internet days. He knew his audience well. The biggest dad joke came when he teased the Extreme classic and wedding song staple “More Than Words”. I would have been perfectly happy if he played the whole thing and I think the majority of the audience would of found it to be a welcomed 3-minute break from the shredding. Nuno can sing, which was apparent his opener “Get the Funk Out”. After the mind-bending time-signatures of Tobin, this song was a welcome change and set the stage for a set of recognizable riffs. I don’t think he’s given enough credit as a singer in Extreme, as those wonderfully jazzy harmonies in “More Than Words” and “Hole Hearted” half belong to Nuno. The highlight was his set of instrumentals from his Extreme days. The opening riff to “Rest in Peace” was a treat to my 12 year old self and my mind immediately went back to that September day in 1992 when the album was released. Someone had convinced me that the album, entitled “Three Sides to Every Story” was a triple album so I made sure to have enough cash on me to account for the higher price tag. There was no Internet around to tell me that there was no truth to this, so when I asked the Strawberry’s clerk where the other 2 discs were, he just thought I was an idiot. On paper Zakk Wylde played only 4 songs; 3 Black Sabbath tunes and a Gary Moore cover with the help of Nuno. But the full truth comes out when looking at the clock and pedometer. Zakk’s set seemed to last about an hour and had him walking and running throughout the crowd on more than 3 occasions. When an artist plays just outside of a major city it can become a challenge to know from whom to ask to receive a scream. Medford is only a few miles outside of Boston, but in most cases it was “Scream for me Medford!”, or a simpler play on that. Zakk did a good job at properly addressing the town of note which was worthy of a quick video. Zakk couldn’t stand still. On at least 3 occasions he wandered into the crowd followed by an alert staff of security and sound people. 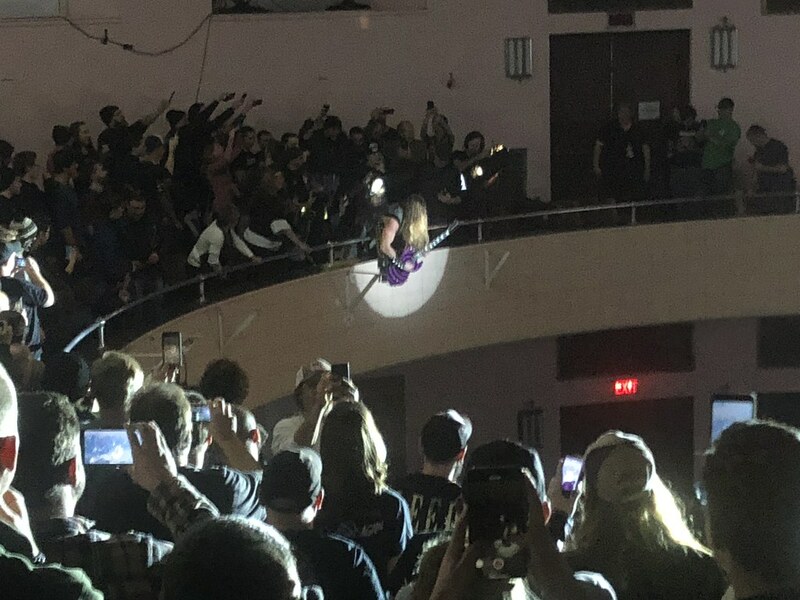 The excitement of this stunt wore off quickly, especially since he went out of view to many in attendance while jamming in various corners of the venue. He went up to the balcony on one occasion, with his guitar slung over the side of the balcony. Luckily, I was perfectly seated for this view. His set ended with a visit from Nuno for the Gary Moore tune, followed by a quick and surprise appearance of Steve Vai. The trio was in good spirits as the PA cut out in their final minutes of shred, which was the only bit of technical difficulties in an evening with impressively strong sound. There was no scheduled break in this 3.5 hour gig. Because Zakk’s set ended with a forced break to fix the PA it was an ideal time for a quick break so there was a large exodus to the lobby. Regretfully, I followed the masses but within a few short minutes everything was fixed. I wished I was at my seat for the explosive intro of “There’s a Fire in the House” but the blue LED lights on his guitar neck helped guide me back as quickly as possible. “Fire Garden” was and is an amazing album, but it was 1995’s “Alien Love Secrets” that kept me in my room for hours learning “Juice” from a magazine. Most of the guitar players had some sort of wireless set-up which allowed them to wander the stage and audience without concern of strangulation. Steve Vai, during his set, was the only exception I saw. It limited his movements to either in front of the monitors or behind the monitors. When he made this small journey his cord required a bit of assistance to cleanly clear the monitors. A guitar wizard cannot be bothered with this activity, and it wouldn’t exactly present a cool image. A member of Vai’s staff was on guard to help move the cord when needed. While he could certainly afford to upgrade to a wireless system, it’s nice to see that Vai is keeping this cord man employed. I don’t know Yngwie personally, obviously. However, he’s always come across as difficult and I’ve never seen anything to prove that perception wrong. Before I heard any of his music I read his interview in Guitar World magazine where he criticizes all of the guitar players I was working so hard to emulate. He may be a flawless player, and all of his points may be correct, but he does not come off as a good guy. Even with this interview in mind, Yngwie was the player I was most excited to see. He didn’t really smile, and I wasn’t sure if he actually wanted to be there. He made some comments to the sound people, but he never had a complete meltdown. I imagine being on his sound team is a somewhat humiliating position. I’d rather be Steve Vai’s cord guy. Yngwie’s signature pose is a single knee bent at 90 degrees, while the other leg is kept perfectly straight. His 55-year-old knees still allow for this, but it’s become his default pose when accessing the floor. As he bent over to adjust the knobs on his pedals he assumed his signature pose. I like to imagine him cleaning the cat’s litter box in this pose as well. I wasn’t sure if he would allow another guitar player to share the spotlight during his solo set. Yngwie probably played the most planned notes of the evening, and I’m not sure he made room for improvisation. Fortunately, Steve Vai appeared to help harmonize on “Black Star“, which was the highlight of his set. Everyone came back to share the stage for 3 more songs to conclude the night. I expected Frankenstein, and the cover of Deep Purple’s “Burn” was the only time Yngwie was given lead-vocal duties. I wish he sang more during it full set. I didn’t anticipate a cover of Bohemian Rhapsody which begged for a group sing-a-long, but I think the crowd was a bit too tired and small to achieve this type of magic. As we funneled out of the venue I overhead a man say “Zakk Wylde took the energy out of the crowd”. I think he dropped a f-bomb somewhere in there. There’s a few ways to take this. Was he so good that the audience was drained? Did his set just go on a bit too long? Did he spend too much time in random corners of the venue going out of view to nearly everyone? I could see his point no matter how he intended it.